If there’s one thing us ladies (and gents) know is that those first tell tale signs of a little too much sun, last night’s sins and perhaps one too many spins around the globe are those pesky little lines that start to appear around your baby blues. 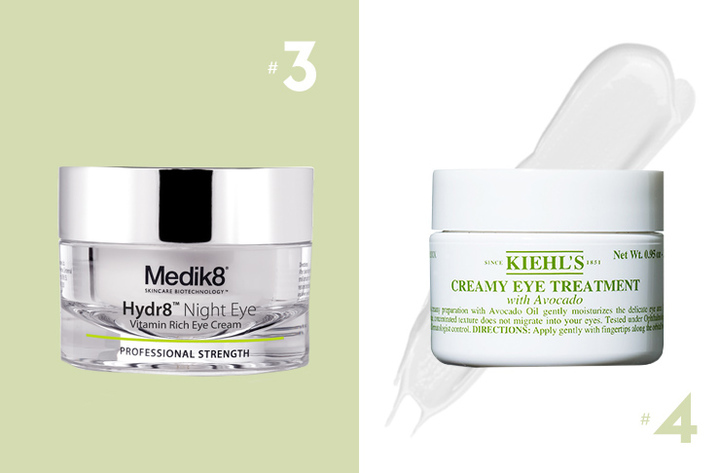 So in the interest of keeping you looking your fresh and fabulous self we’ve rounded up eight of the best anti-aging eye creams on the market right now. You’ll be going back in time with this little beauty from Dermalogica. 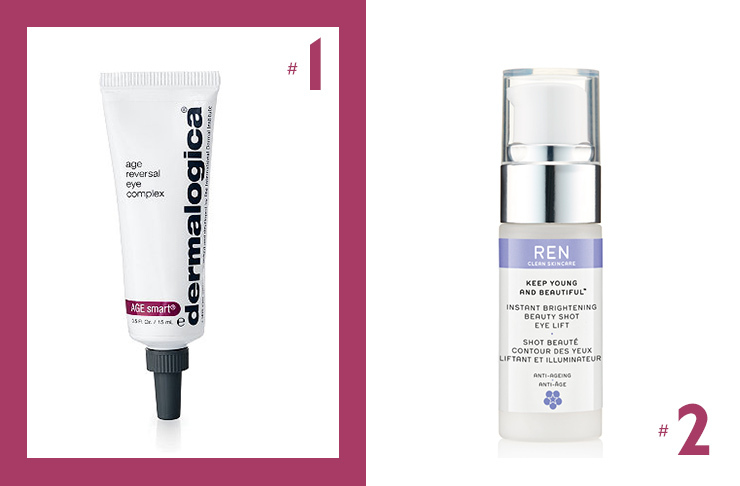 There’s no need to worry about fine lines thanks to the addition of Retinol, Vitamin C and their exclusive UGL complex which gives you the boost you need to strengthen that ever so delicate eye region and all without any artificial fragrances or colours, now that’s a win in all our eyes. Dermalogica Age Reversal Eye Complex available from Dermalogica in store and online. No need to have a surgeon on speed dial because we’ve found the next best thing to an eye lift—the Keep Young And Beautiful Instant Firming Beauty Shot by Ren. Expect to be rocking a radiant glow in no time as the skin firming serum nourishes and plumps your eye area, meaning you stay looking fresh as a daisy. Ren Keep Young and Beautiful Instant Firming Beauty Shot available from Mecca. Giving new meaning to the term, woke up like this, Medik8 Hydr8 Night Eye is the ultimate way to maximise those eight blissful hours each night. Gliding on to your skin like a sweet dream, it is packed full with all the good stuff like vitamin A, hyaluronic acid for hydration and a product that will quickly become your go to. Medik8 Hydr8 Night Eye available online. With ingredients almost good enough to eat (we’re serious) the Kiehl’s Creamy Eye Treatment is nature’s goodness in a jar with luscious avocado oil, beta carotene (the good stuff found in carrots) and some soothing shea butter. While it feels thick when you put it on, it absorbs quickly leaving skin looking bright and moisturised. We may have been known to put this on other dry areas like our noses when the colder weather kicks in. Kiehl's Creamy Eye Treatment with Avocado is available from Kiehl’s in store and online. 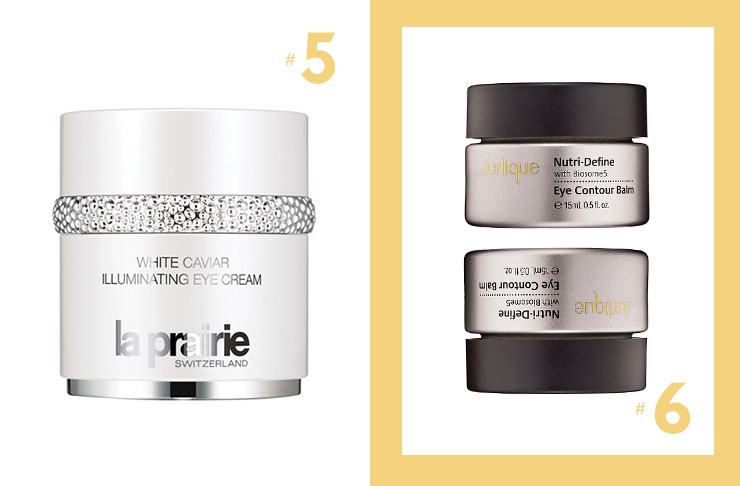 If ever an eye cream were to be considered decadent it would be White Caviar Illuminating Eye Cream by La Prairie. Yes, white caviar is something that’s worth indulging in the next time you want to add something a little fancy to your makeup bag. It’ll leave your skin looking brighter, feeling fresher and is overall a wonderful investment in all your future selfies. La Prairie White Caviar Illuminating Eye Cream available from La Prairie in store and online. All of the moisturising goodness you need to turn back the clock and bring some much needed glowy and dewy fabulousness to your eye contour area. The Jurlique Nutri-Define Eye Contour Balm targets all those things we hate, from deep lines, to crow’s feet and saggy skin, so can we get an amen? Oh, and it comes with a nifty applicator that has a refreshing and de-puffing affect for eyes. Jurlique Nutri-Define Eye Contour Balm 15ml available from Jurlique in store and online. 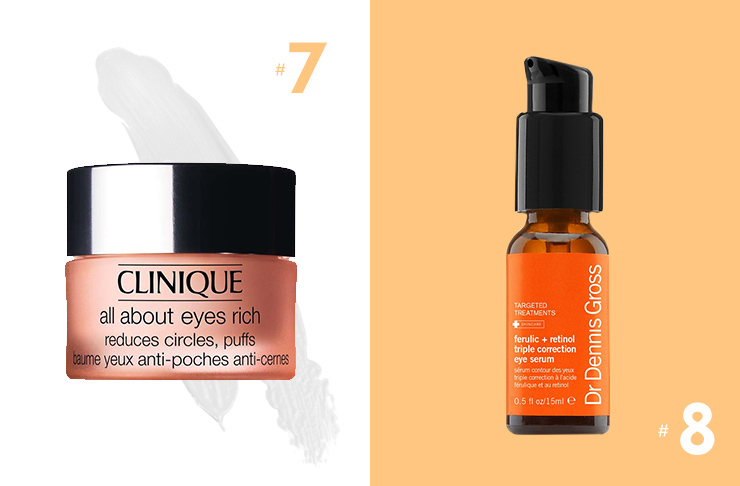 Because we’re all about those eyes, Clinique has come to the rescue with their super moisturising eye cream. All About Eyes Rich performs a vanishing act on those horrendous, I-shouldn’t-have-had-that-extra-drink under eye circles and those tell tale shadows. It’s packed with botanicals and also aids collagen production, enough said, it’s in our cart already. Clinique All About Eyes Rich available from Clinique in store and online. A serum rather than a cream, Dr Dennis Gross has created a product that’s perfect for not only underneath your eyes but also on your eyelids. With antioxidants to keep you wrinkle free (well, almost), liquorice root for added brightness and caffeine for firming (yes please) the silky formula also means putting on your makeup is a complete breeze. Dr. Dennis Gross Skincare Ferulic+Retinol Tripple Correction Eye Serum available from Mecca.